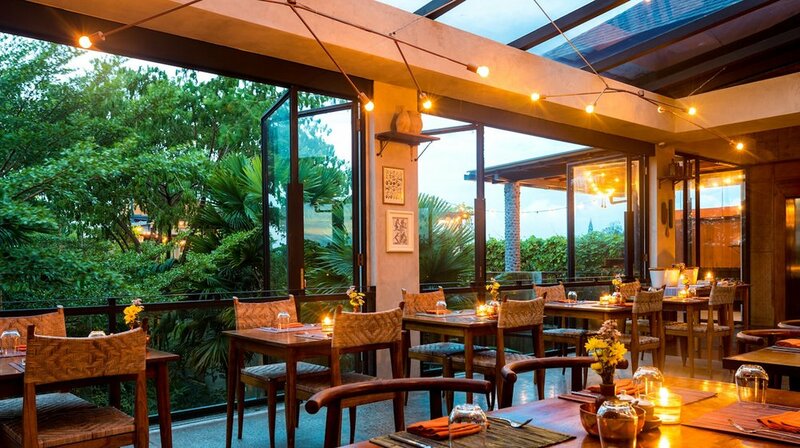 Ubud is like nowhere else, and Bisma Eight reflects that. Our dining options are an authentic and inspired blend of the flavors that have always brought people to Ubud and what those ingredients mean to us. Copper Kitchen, Bar & Rooftop is a Seasonal Earth-to-Table dining experience. Food that embraces the depth of International-Asian culinary traditions and the skill and élan using locally grown and ethically sourced produce. It serves up natural and earth-friendly meals for today's conscious folk. Discover all the secrets to our expertly handcrafted bevvies and learn about the fresh ingredients we use in our drink creations. The fun starts as soon as you take a seat to learn all the tricks of the trade from prepping to mixing, then shaking and stirring, so get behind the bar and create a drink of your choice! Get crafty with our Barmen! Crafty Mocktail is priced at IDR 400.000++ per person for non residents, and complimentary for all residents. Crafty Cocktail is priced at IDR 220.000++ per person for Bisma Eight residents, and IDR 550.000++ per person for non residents. 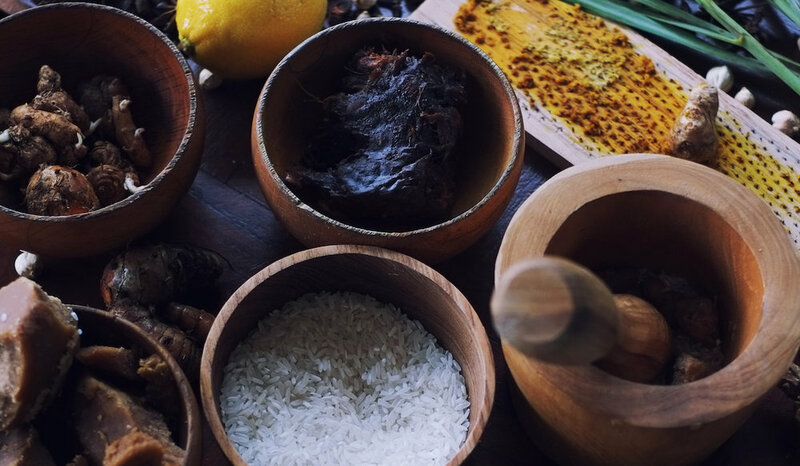 Jamu is Indonesia’s system of traditional herbal medicine used by many for the prevention and treatment of a variety of ailments. Jamu is said to have originated 1300 years ago in the Javanese Royal Courts, and is still practised today throughout Indonesia. By knowing Jamu transformation today, this is certainly very good for the sustainability of herbal medicine in Indonesia. No matter what, the heritage of the ancestors must be preserved. So, know your Jamu, craft your own Jamu, and don’t forget to always drink Jamu! Jamu Workshop is priced at IDR 150.000++ per person for non-staying guests, and IDR 100.000++ per person for all staying guests. Thank you! Our team will get back to you shortly to confirm. The Library Café brings together two of life’s greatest joys – coffee and literature – and allows you to lose track of a day between two covers, while never leaving the comfort of your chair. Check out The Library Café’s latest Warm Cocktails. What could be more quintessentially ‘Bali’ than sitting in the sun, having a drink, and unwinding completely? The Pool Pavilion is Bisma Eight’s take on the iconic South Seas moment. Folk Pool & Gardens, No Más, and Liap Liap are the latest brainchild of Bisma Eight Group. All Food and Beverage at each venue is led by Head Chef Roy Qira. At Folk Pool & Gardens Roy aims to blur the lines between breakfast, lunch and dinner to create an all-day culinary mash-up. Produce is sourced locally from sustainable partners with select items made in-house wherever possible where coffee is always a fresh blend developed by Tetap Happy Coffee Roasters. 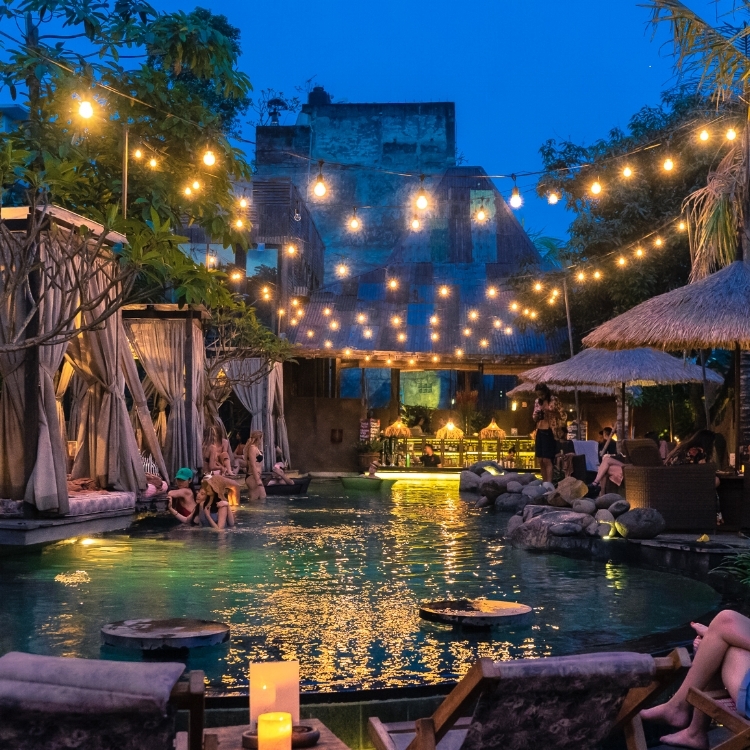 As for No Más, it is Ubud's long awaited local bar with rotating live bands and DJs going hand in hand with hard tipples and scrumptious late bites, and where the guys discuss failed marriages and bad app ideas, the squad takes no responsibility in bad-decision making up there. Teaming up with the renowned Chef Mandif Warokka, Liap Liap is a modern take of Indonesian grill revisiting the roots of traditional-exotic grilling and smoking techniques, it is the hood's very own crackling flame of charcoal embers. All located on the main road of Monkey Forest, with Folk Pool & Gardens sits beautifully in the back of the property, while Liap Liap is situated at the front, and No Más can be easily spotted right above Liap Liap on the 2nd floor. From the beautiful imperfections of its people and charming clash of cultures comes Folk Pool & Gardens, Ubud’s first swim up bar and seasonal twilight poolside cinema located right in the heart of town, it’s a tounge-in-cheek neighborhood setting with private daybeds, teepees and decks line the pool with food range from vegetarian to grill and drinks from craft options to classics. They're open daily at 9AM to 10PM. LIAP LIAP is now open for public on 8 June 2018, 10AM to 11PM daily. Chef de Cuisine Mandif Warokka, Head Chef Roy Qira, and the crew at Liap Liap place their commitment in searching the far reaches of the Indonesian islands for its iconic culinary endeavours and flavours. The discovery has led in taking cues from the brave tribes of the region and to embrace said roots in the showcasing of traditional, indigenous cooking styles. Combining exotic grilling and smoking techniques, the team proudly shares and delivers to you an archipelago-inspired cuisine like no other. The space gives nods to homegrown accents, tropical touch points, and preserved textural layers to provide a pleasant, airy vibe that sets itself as progressively uncategorised. They're open daily at 10AM to 11PM. No Más is Ubud’s latest 2nd storey bar. Located on Monkey Forest Street, follow a neon-lit arrow sign upstairs, 'Treasure This Way', right above Liap Liap restaurant for bird’s-eye views of the street below, thirst-slaking bevvies, late bites, with an island mix of locals, expats and travellers. Where easy food, stiff drinks, failed marriages, bad app ideas happen. No Más is your new Island sinkhole awaits. Opens daily from 5 PM until late. IDR 350K ++ per person, up to 4 people per session, book using button below. Choose your best available Wednesday!